In 1813, a locally noted person stood up to improve the irrigation situation around Ishino village and dozen other small villages. His name was Misumi Johachi, a head of Tomochi district. He started excavating a 11 km-long weir of Kashiwa River, which was a branch of Midori River. When he was working on the construction at the deep gorge of Okedaki Waterfall, he asked a stonemason from Notsu, Iwanaga Sangoro, to build an aqueduct bridge. The bridge with the size of 15.5 meters long, 3.6 meters in width and 10 meters high was completed in 1817. A local record has the names such as the deputy Fuwa Keijiro and a mountain control Shinohara Zenbei, which is an important source to learn about the construction work at that time. In an archives of Misumi Family, there is a record saying that "this Kashiwa River weir excavation is the hardest work in this region." 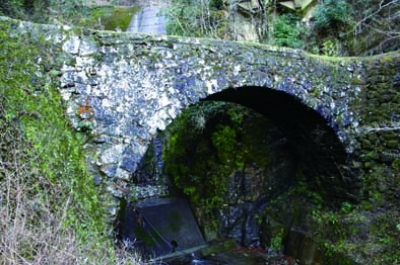 This bridge is over 190 years old, but is still working as an aqueduct to supply water to 124 hectare farmland. This is also the oldest single-arch aqueduct bridge still in service in Kumamoto. It is said that this bridge, designated as a Prefectural Cultural Property, was a model for the Tsujunkyo Bridge in Yamato Town.